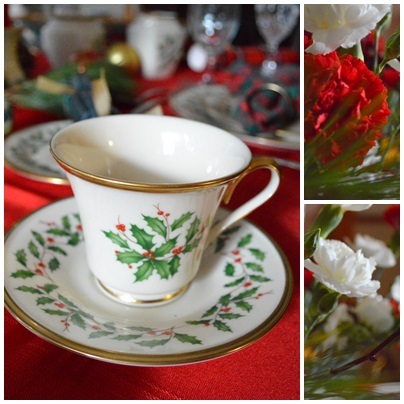 I love Christmas China but I don’t own it. 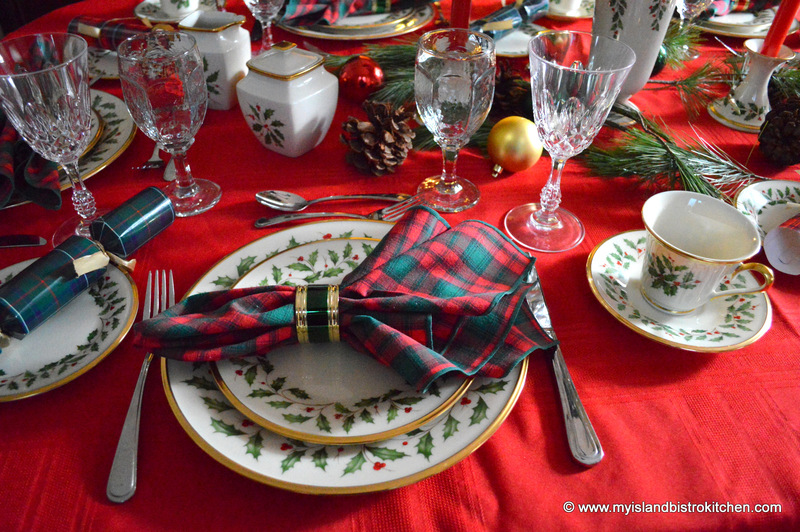 When a friend discovered my fondness for Christmas China, she graciously offered her wonderful setting for 12 of Lenox’s “Holiday” pattern for a photoshoot for my Tablescapes section here on my food blog. Needless to say, I was thrilled to set her dining room table with six placesettings of this lovely China pattern. I started with a solid red tablecloth to make the dinnerware pop. 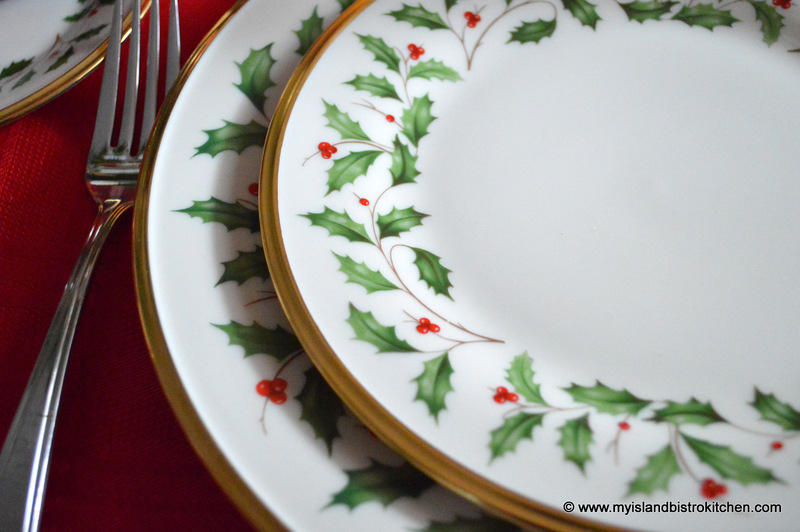 It adds a cheerful, vibrant, yet warm look to the table, perfect for a traditional Christmas dinner. And here is the insigna on the bottom of the china. The owner has the completer set to complement the dishes and has many other pieces as well, too many to use in one photoshoot! 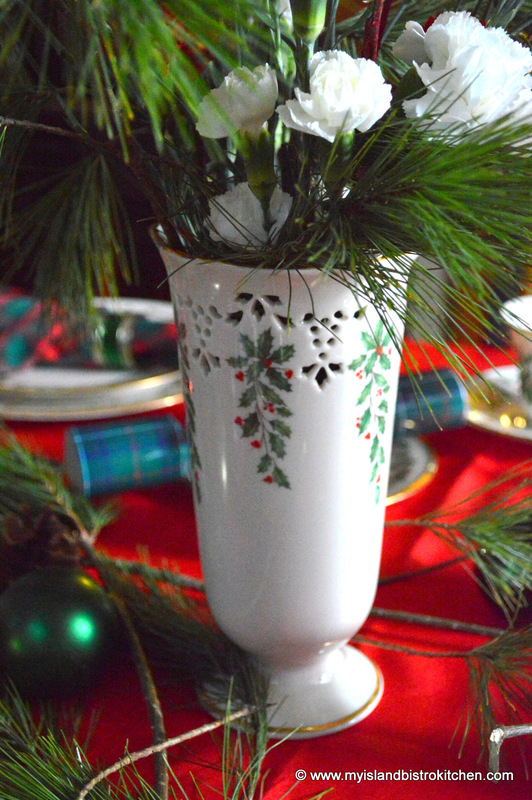 When I discovered she had the lovely vase and matching candlesticks in the “Holiday” pattern, I knew they had to be the centerpiece for the table. Take a look at the beautiful cutwork in the design of the vase. 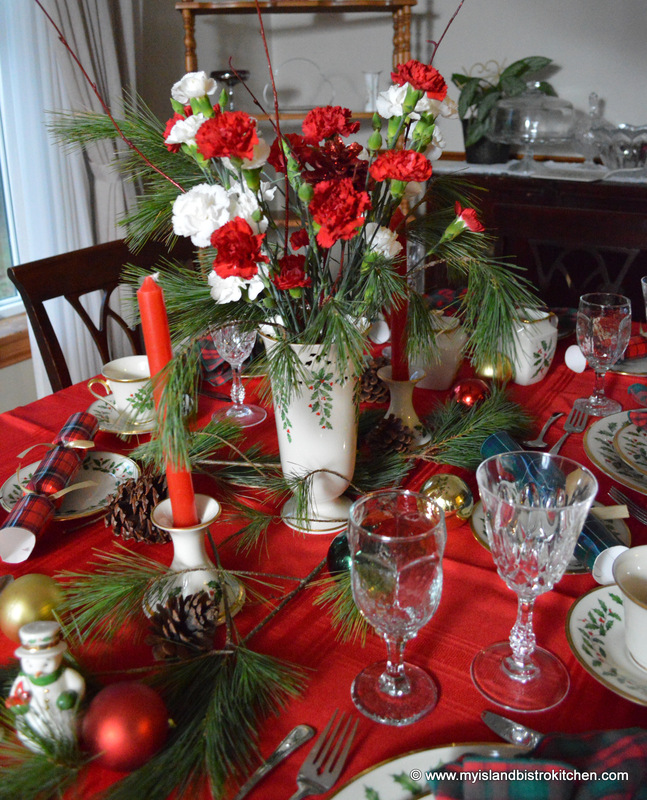 I chose red and white carnations with some fresh pine and red tapers to match the colors in the China pattern. 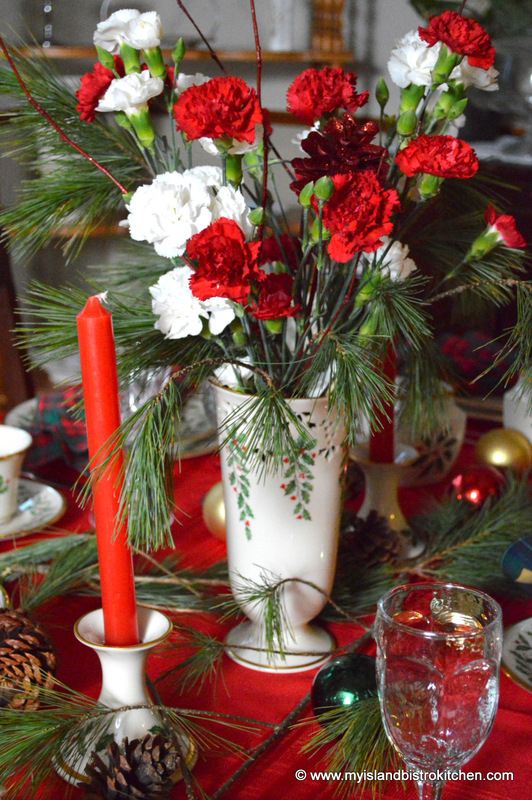 To draw the eye to either end of the table, I simply trailed some fresh pine down the center of the table and added some pine cones and red, green, and gold balls to tie the look together. 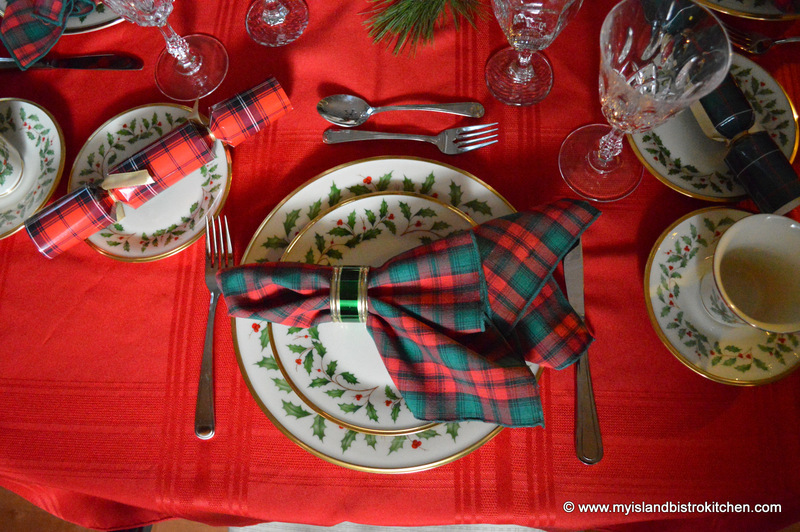 I used the owner’s green and red plaid napkins. Plaid always gives such a nice warm feeling. Matching green napkin rings complete the look. 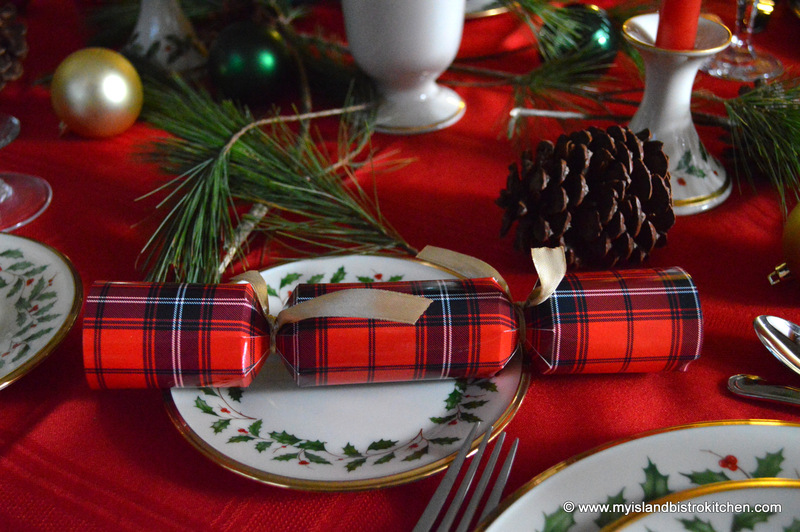 Plaid Christmas crackers add a fun and festive flair to the setting. 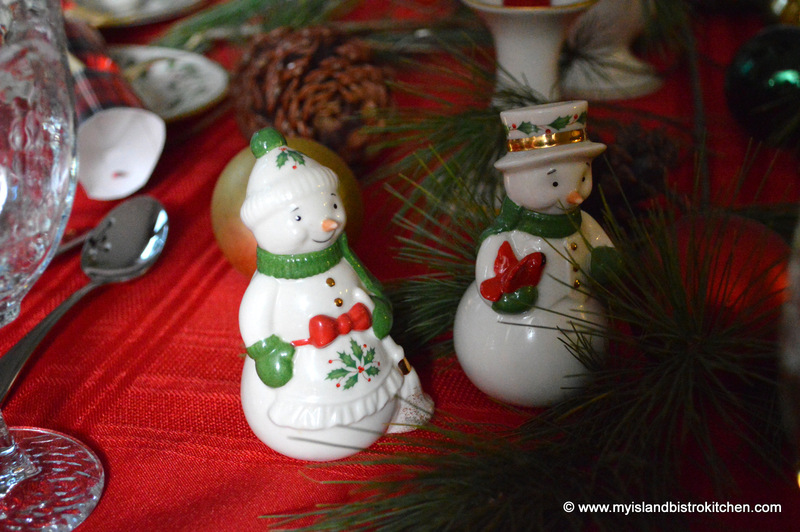 The little salt and pepper shakers also bear the “Holiday” pattern and add a touch of whimsy to the tablescape. A simplistic yet elegant shape for the cup and saucer. 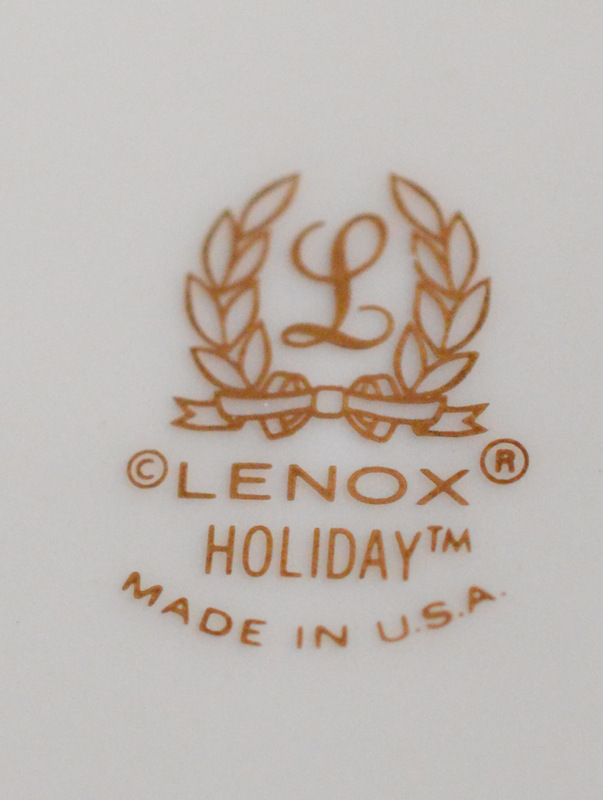 I hope you have enjoyed viewing the tablesetting featuring the beautiful Lenox “Holiday” pattern. 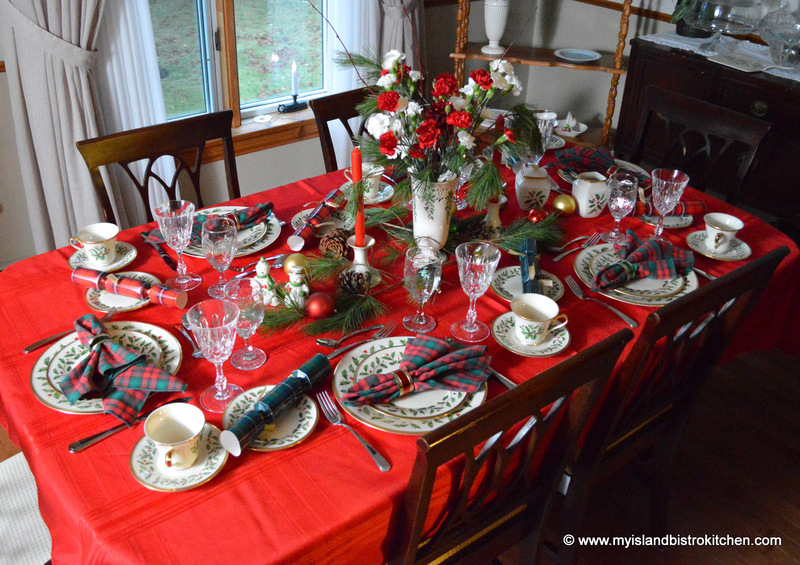 My thanks to the owner for giving me the privilege of setting a holiday table with this beautiful China. 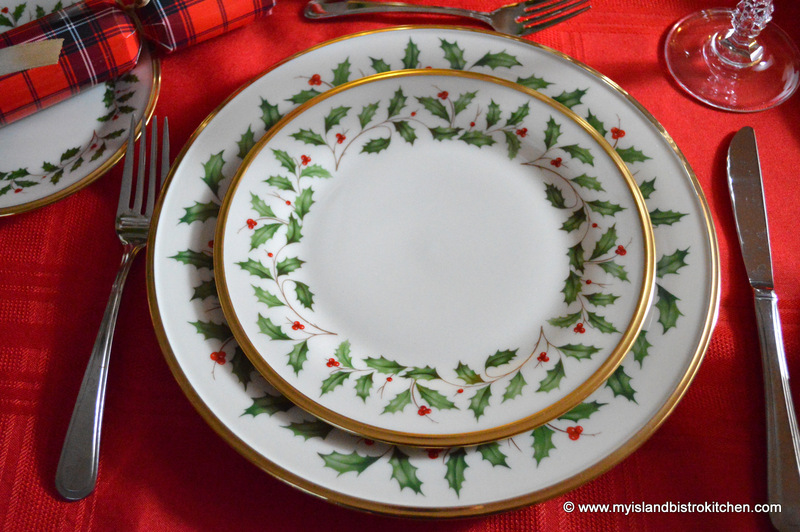 If you live on Prince Edward Island, where I live, and have beautiful China – Christmas or otherwise, vintage or formal – and would like to share and have it featured in a tablesetting here on my food blog, please don’t hesitate to get in touch with me to see what we could arrange. Unfortunately, I can’t commit to off-Island photoshoots of tablesettings due to travel logistics.